I'm Curious Too: Can Humans Regenerate Lost Limbs? Some animals are known for their regenerative power. If a salamander loses its leg, it can grow a new one within weeks. Crabs and spiders for example, can also regenerate lost limbs. If you held a small lizard by its tail, chances are that it would shed its tail in order to escape. And no, it wouldn't die from its injury. So why can't humans do the same? To understand why we can't regrow lost limbs like amphibians, we have to first understand how scarring occurs. Take for example, someone loses an entire index. When a finger is severed, the site is exposed to air. This sudden exposure alerts the immune system, which responds by sending white blood cells to combat invading pathogen and platelet to stop bleeding. The congregation of platelet coagulates the bleeding site, causes inflammation and the formation of scar tissue. Scar tissue prevents any future cellular development in the area. That's why scars last -- cells are prevented from doing a repair job on that skin. 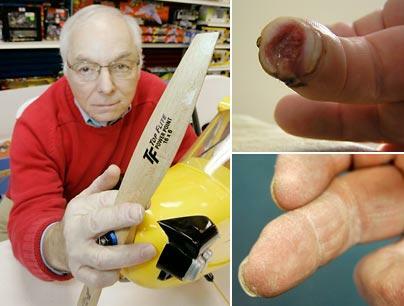 In 2011 I watched a documentary about a man whose fingertip have regenerated after it was amputated by the turning propeller of a model plane. He has a brother working in the tissue-regeneration business, who told him to apply a layer of extracellular matrix extracted from pig's bladder on the amputated site. Few months later, he had regrown the fingertip--bone, nail, skin and all. The extracellular matrix is actually a type of collagen which functions outside of the body's cells. This material works in human fetuses to grow everything from blood vessels to toes. Scientists believe that upon reaching full development, the matrix stops functioning. When extracellular matrix is applied to a wound, it doesn't trigger an immune response. Instead, it causes the cells in that tissue to start repairing the damage the way they would in a developing fetus. Afghan war veteran Corporal Isaias Hernandez lost 70% of his thigh muscles in a mortar attack in 2004. The doctors kept telling Hernandez he would be better off with an amputation. Treatment with the extracellular matrix extracted from pig's bladder improved his condition, and in several weeks his leg began growing both in strength and bulk. The extracellular matrix technique is a very promising method. But even without the help from extracellular matrix, it seems that we can regenerate certain parts of our body. Back in the 1970s, scientists discovered that children under the age of two can actually regrow a lost fingertip, provided that there's a bit of nail remains and the wound isn't stitched up. Fast forward to June 2013, Mayumi Ito et al of New York University have identified the reason why the bit of nail is important for regeneration. The researchers found a small population of self-renewing stem cells beneath the nail. 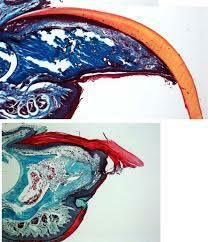 The stem cells sustain the nail's growth based on the signals carried by the Wnt family of proteins. When a finger is severed, the Wnt is activated in the epithelium beneath the remaining nail and attracts nerves to the area. The nerves then induce the growth of mesenchymal cells through a protein called FGF2 to restore tissues such as bone, tendons and muscle. Digit tips, including bone, can regenerate by 5 weeks after amputation in normal mice (top). But the regeneration failed in mice that lacked a crucial signalling pathway (bottom). Image: Nature magazine. The researchers discovered that the same pathway is involved in the regeneration of lost mouse toe tips. Digit tip, including the bone, can regenerate by 5 weeks after amputation in normal mice. But if too much nail epithelium is lost, then the Wnt cannot be activated, and thus the tissues cannot regenerate. This actually means one thing: lost your fingertip, but don't lost your nail. Of course, the regenerative prowess of mammals is limited compared to the regenerative powers of amphibians. 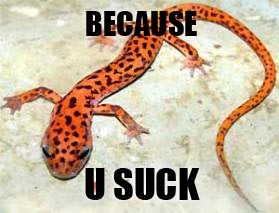 We, after all, can't afford to lose and regrow an entire limb like salamanders. What we can do is just a tiny part of what amphibians can do. Perhaps with the advancement of stem cell research and the help from extracellular matrix we can one day regenerate the lost arms and legs of the unfortunate.